Former First Lady Barbara Bush has died at the age of 92. Barbara Bush was the matriarchal figure of a political dynasty that included two presidents – her husband George H.W. Bush and son George W. Bush. She was first lady from 1989 to 1993 and had been in failing health for some time and had declined further medical treatment. George H.W. Bush, at 93, is the longest-lived US president. Their son, George W. Bush, was elected in 2000 and served two terms as the nation’s 43rd president. Barbara Bush was also the mother of Jeb Bush, who served as governor of Florida from 1999 to 2007 and unsuccessfully ran for the White House in 2016. As first lady, she went beyond the traditional role of a political spouse, founding the Barbara Bush Foundation for Family Literacy to help parents and children from disadvantaged communities to read and write. Barbara Bush was a fierce advocate of civil rights and went against many of her husband’s Republican party supporters with her more liberal view on abortion rights. In a statement from the White House, President Donald Trump said the former first lady would be long remembered for her devotion to country and family, “both of which she served unfailingly well”. Barack and Michelle Obama also described Barbara Bush as “the rock of a family dedicated to public service” and as “an example of the humility and decency that reflects the very best of the American spirit”. Former President Bill Clinton said Barbara Bush was “feisty in support of her family and friends, her country and her causes”. Bill Clinton said he and his wife, Hillary, would “never forget the courtesy she and President Bush showed us”. 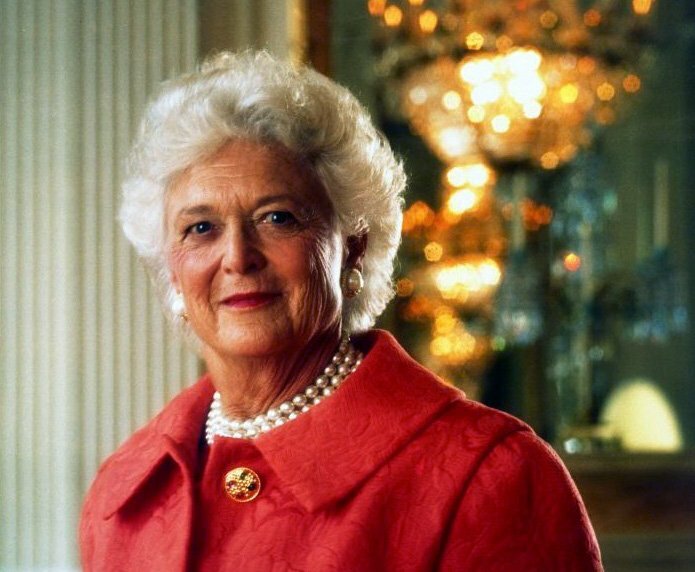 Barbara Bush was known for her snow-white hair and was dubbed “The Silver Fox” by her family. George H.W. Bush, who served as the 41st US president, suffers from a form of Parkinson’s disease and uses a wheelchair. It was recently announced that Barbara Bush had declined further medical treatment after a series of hospital visits, but the statement did not reveal the nature of her ailments. The former first lady said she wanted to spend her last days in “comfort care” with her family. Barbara Bush was born Barbara Pierce, the daughter of Marvin Pierce, publisher of McCall’s magazine. She grew up in Rye, New York. She met George H.W. Bush in 1941 at a Christmas party in Connecticut and the couple celebrated their 73rd wedding anniversary in January this year. They had six children including a daughter, Robin, who died of leukaemia aged three in 1953. As well as George and Jeb, the other Bush children are Neil, Marvin and Dorothy. Barbara Bush was one of only two women whose husband and son became US president, and the only one to have seen them both sworn in. Abigail Adams was married to the second US president, John Adams, and was the mother of the sixth, John Quincy Adams, although she did not live to see their son elected.